IBM MobileFirst for iOS Loan Advise provides mortgage officers with discussion prompts, guided prospecting questions, and loan product recommendations. Mortgage officers often struggle to remember all the questions they must ask prospective borrowers when identifying their loan requirements. Loan Advise helps mortgage officers by providing guided questions and prompts during this critical process. Through a straightforward and easy-to-use dashboard, Loan Advise walks a mortgage officer through the task of capturing the key information needed to establish customer profiles and make analytics-driven "best-fit” loan product recommendations. Access client profile information quickly and initiate calls using the iPad’s voice-activation capability to maximize your drive-time productivity. Calendar functionality helps loan officers manage appointments while mapping functionality enables you to ensure a timely arrival for a client meeting. 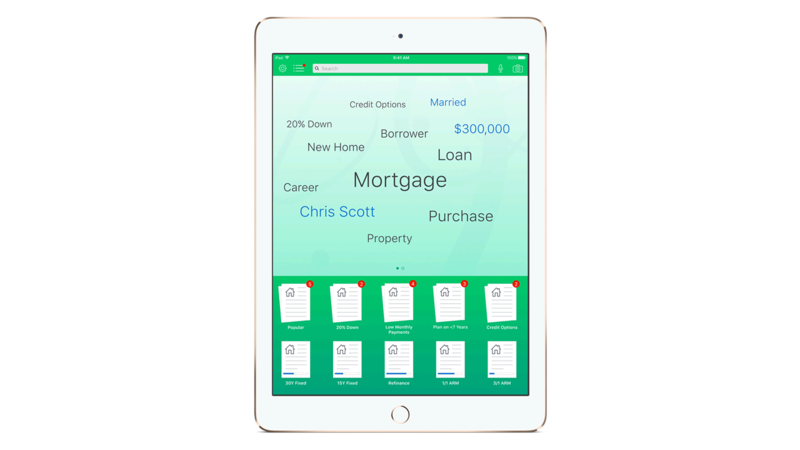 Easily capture documents with the iPad’s built-in camera. Upload documents on the go to initiate the loan application process. Personalize “best fit” portfolio offerings using real-time analytics. Drive product recommendations based on a prospect’s profile information. Product comparisons are generated in real-time to enable your loan officers to quickly review product recommendations and suggestions with prospective clients. Empower wealth advisors with critical client meeting data.